Oxalate and glycollate are widely distributed in plant tissues (Hodgkinson 1977) where they both play important biochemical and physiological roles. In animals, oxalate presents toxicological problems associated with ingestion of large amounts of free acid (Zarembski and Hodgkinson 1967) and it assumes pathophysiological importance by virtue of the extreme insolubility, within the physiological range of pH, of its calcium salt in tissues and body fluids. The main impact of this is in relation to the urinary tract where crystals of calcium oxalate may be deposited to form calculi. 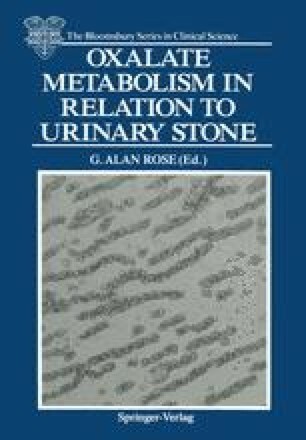 The importance of oxalate in the formation of urinary calculi cannot be overstressed. Yet the rapid and precise measurement of this anion has presented considerable problems to investigators in this field. Some of these problems will be considered more fully in later sections of this chapter.